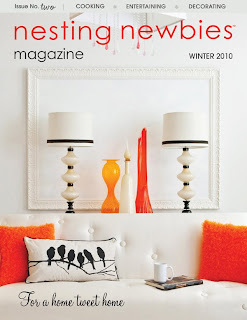 Aphro Chic has a post on a new home decor magazine called Nesting Newbies that I had no idea about. (Read the post here). The magazine is in digital form, which means more competition for Lonny. The premiere issue debuted last fall (check it out here) and the Winter issue just became available here. I'll be taking a more in-depth look at the magazine for an upcoming post. Check back soon. Jonathan Adler Lacquer Placemat ($38). 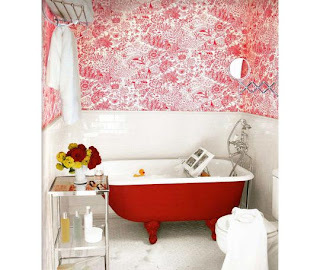 Adler's new lacquer mat comes in a few colors, but fire-red is the choice for V-Day. And it's made in Vietnam, so you'll get a bit of history with your purchase. 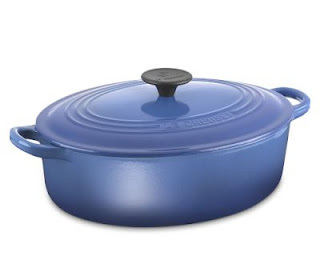 Browsing through Williams-Sonoma's Web site, I spotted the Le Creuset Wide Oval Dutch Oven (3.5qt) on sale for $129.95, down from $255. Such a steal! A cozy blanket or comforter. Votives for the dinner table (adds an element of charm to any meal). 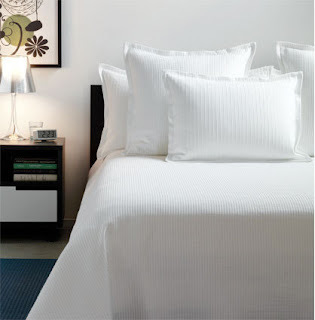 Crisp, white sheets (the best feeling in the world). Great silverware (you can never go wrong without this and it really does last forever). A large mirror for getting dressed (nothing's fun about getting a good look at your outfit from a teeny-sized mirror). A great piece of art that speaks to your character (it's about what you and you alone like--forget about following trends when it comes to buying art since we all know they come and go). Liquid handsoap for the bathroom (Method makes a great one packaged in a cute bottle) as well as towels for drying hands. Mrs. Meyers household cleaners (lavender and lemon verbena are the best from the line in my opinion). A chaise for reading, rest and relaxation (the perfect thing for a Sunday indoors). Coasters (because beverage marks on the coffee table are so unsightly and can be hard to remove at times). Flashlights w/ batteries, hammer and nails (flashlights for when the power goes out suddenly, hopefully, not often, and a hammer and nails since something always needs to be fixed or hung on the wall). Anyone that knows me is aware that I write everything down and am big on to-do lists. At home, I have a notebook lying around just about everywhere. But the one place where it's an absolute must is my bedside table. When I think of bedside table decor, a notebook or some type of writing journal just has to be in the picture. You never know when a great idea will hit you that you don't want to take the chance of forgetting. I also like to have a vase with flowers nearby now and again. And tons of reading material is a must as well. I had to pick up the latest issue of Architectural Digest to see why there's been so much fuss about Jennifer Aniston's newly redesigned home in Beverly Hills. Her designer, Stephen Shadley, who's also worked with Diane Keaton and Woody Allen, was able to create an element of serenity throught the space, which I find appealing. My favorite part of the house is the entrance. It has such a presence that can even be felt from looking at the photo alone. The front doors are 14-feet tall and they are surrounded by beautiful stonework. And to top it all off, there's a cute koi pond on either side of the walkway leading up to the doors. It really is absolutely gorgeous. 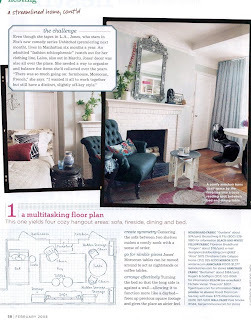 One of my all-time favorite Domino features was on Rashida Jones' NYC apartment. It wasn't overly styled and it had such a comfortable feel. Sometimes when you look at celebrities' homes in magazines, it seems like they haven't spent a day in their place. This, on the other hand, is a lived-in apartment and one with tons of style. 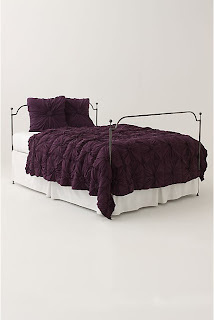 Rosette Bedding ($58-$268). I once painted my bedroom in this gorgeous deep purple, so this really brings back memories for me. This bedding is elegant and simple--just the way I like it. Latte Bowls ($30). 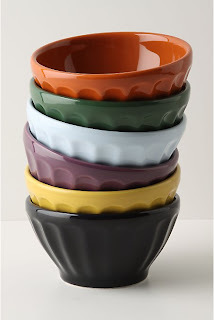 You can never have enough of these bowls and the colors are just great. Desert Dandelion Single Switchplate ($38). 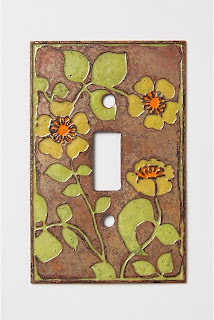 Small details like updating a light switch cover can add a nice touch to a room. The wildflowers on this cover are so cute. 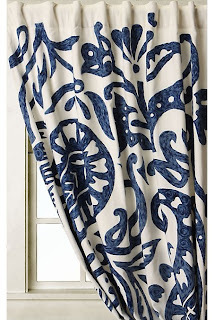 Lakarri Curtain ($208-$268). What a nice island vibe this print has.